The DMD gene, encoding the dystrophin protein, is one of the longest human genes known, covering 2.3 megabases (0.08% of the human genome) at locus Xp21. The primary transcript in muscle measures about 2,100 kilobases and takes 16 hours to transcribe; the mature mRNA measures 14.0 kilobases. The 79-exon muscle transcript codes for a protein of 3685 amino acid residues. Dystrophin is a protein located between the sarcolemma and the outermost layer of myofilaments in the muscle fiber (myofiber). It is a cohesive protein, linking actin filaments to another support protein that resides on the inside surface of each muscle fiber’s plasma membrane (sarcolemma). This support protein on the inside surface of the sarcolemma in turn links to two other consecutive proteins for a total of three linking proteins. The final linking protein is attached to the fibrous endomysium of the entire muscle fiber. Dystrophin supports muscle fiber strength, and the absence of dystrophin reduces muscle stiffness, increases sarcolemmal deformability, and compromises the mechanical stability of costameres and their connections to nearby myofibrils; as shown in recent studies where biomechanical properties of the sarcolemma and its links through costameres to the contractile apparatus were measured, and helps to prevent muscle fiber injury. Movement of thin filaments (actin) creates a pulling force on the extracellular connective tissue that eventually becomes the tendon of the muscle. Dystrophin deficiency has been definitively established as one of the root causes of the general class of myopathies collectively referred to as muscular dystrophy. The large cytosolic protein was first identified in 1987 by Louis M. Kunkel, after the 1986 discovery of the mutated gene that causes Duchenne muscular dystrophy (DMD). Normal skeletal muscle tissue contains only small amounts of dystrophin (about 0.002% of total muscle protein), but its absence (or abnormal expression) leads to the development of a severe and currently incurable constellation of symptoms most readily characterized by several aberrant intracellular signaling pathways that ultimately yield pronounced myofiber necrosis as well as progressive muscle weakness and fatigability. Most DMD patients become wheelchair-dependent early in life, and the gradual development of cardiac hypertrophy—a result of severe myocardial fibrosis—typically results in premature death in the first two or three decades of life. Variants (mutations) in the DMD gene that lead to the production of too little or a defective, internally shortened but partially functional dystrophin protein, result in a display of a much milder dystrophic phenotype in affected patients, resulting in the disease known as Becker's muscular dystrophy (BMD). In some cases the patient's phenotype is such that experts may decide differently on whether a patient should be diagnosed with DMD or BMD. The theory currently most commonly used to predict whether a variant will result in a DMD or BMD phenotype, is the reading frame rule. Though its role in airway smooth muscle is not well established, recent research indicates that dystrophin along with other subunits of dystrophin glycoprotein complex is associated with phenotype maturation. A variant of the DMD gene, which is on the X chromosome, named B2006, appears to be an introgression from a Neanderthal-modern human mating. ↑ Tennyson CN, Klamut HJ, Worton RG (1995). "The human dystrophin gene requires 16 hours to be transcribed and is cotranscriptionally spliced". Nature Genetics. 9 (2): 184–90. doi:10.1038/ng0295-184. PMID 7719347. ↑ García-Pelagio KP, Bloch RJ, Ortega A, González-Serratos H (2011). "Biomechanics of the sarcolemma and costameres in single skeletal muscle fibers from normal and dystrophin- null mice". J Muscle Res Cell Motil. 31 (5-6): 323–336. doi:10.1007/s10974-011-9238-9. PMID 21312057. ↑ Hoffman EP, Brown RH, Kunkel LM (1987). "Dystrophin: the protein product of the Duchenne muscular dystrophy locus". Cell. 51 (6): 919–28. doi:10.1016/0092-8674(87)90579-4. PMID 3319190. ↑ Monaco AP, Neve RL, Colletti-Feener C, Bertelson CJ, Kurnit DM, Kunkel LM (1986). "Isolation of candidate cDNAs for portions of the Duchenne muscular dystrophy gene". Nature. 323 (6089): 646–50. doi:10.1038/323646a0. PMID 3773991. ↑ Hoffman, EP; Brown RH, Jr; Kunkel, LM (24 December 1987). 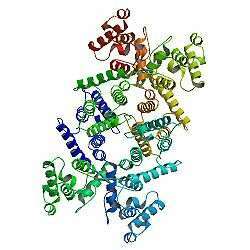 "Dystrophin: the protein product of the Duchenne muscular dystrophy locus.". Cell. 51 (6): 919–28. PMID 3319190. ↑ Aartsma-Rus A, Van Deutekom JC, Fokkema IF, Van Ommen GJ, Den Dunnen JT (2006). "Entries in the Leiden Duchenne muscular dystrophy mutation database: an overview of mutation types and paradoxical cases that confirm the reading-frame rule". Muscle Nerve. 34 (2): 135–44. doi:10.1002/mus.20586. PMID 16770791. ↑ Sharma P, Tran T, Stelmack GL, McNeill K, Gosens R, Mutawe MM, Unruh H, Gerthoffer WT, Halayko AJ (2008). "Expression of the dystrophin-glycoprotein complex is a marker for human airway smooth muscle phenotype maturation". Am. J. Physiol. Lung Cell Mol. Physiol. 294 (1): L57–68. doi:10.1152/ajplung.00378.2007. PMID 17993586. ↑ Sadoulet-Puccio HM, Rajala M, Kunkel LM (1997). "Dystrobrevin and dystrophin: an interaction through coiled-coil motifs". Proc. Natl. Acad. Sci. U.S.A. 94 (23): 12413–8. doi:10.1073/pnas.94.23.12413. PMC 24974 . PMID 9356463. ↑ Ahn AH, Freener CA, Gussoni E, Yoshida M, Ozawa E, Kunkel LM (1996). "The three human syntrophin genes are expressed in diverse tissues, have distinct chromosomal locations, and each bind to dystrophin and its relatives". J. Biol. Chem. 271 (5): 2724–30. doi:10.1074/jbc.271.5.2724. PMID 8576247. ↑ Yang B, Jung D, Rafael JA, Chamberlain JS, Campbell KP (1995). "Identification of alpha-syntrophin binding to syntrophin triplet, dystrophin, and utrophin". J. Biol. Chem. 270 (10): 4975–8. doi:10.1074/jbc.270.10.4975. PMID 7890602. ↑ Gee SH, Madhavan R, Levinson SR, Caldwell JH, Sealock R, Froehner SC (1998). "Interaction of muscle and brain sodium channels with multiple members of the syntrophin family of dystrophin-associated proteins". J. Neurosci. 18 (1): 128–37. PMID 9412493. ↑ Ahn AH, Kunkel LM (1995). "Syntrophin binds to an alternatively spliced exon of dystrophin". J. Cell Biol. 128 (3): 363–71. doi:10.1083/jcb.128.3.363. PMC 2120343 . PMID 7844150. ↑ Khan, Razib (January 25, 2011). "Neandertal admixture, revisiting results after shaken priors". Discover Magazine. Retrieved March 27, 2013. Saladin, Kenneth. Anatomy and Physiology: The Unity of Form and Function, 6th ed. McGraw-Hill. New York, 2012. "DMD." Genetics Home Reference. U.S. National Library of Medicine, 2 Dec. 2012. Web. 09 Dec. 2012. Roberts RG, Gardner RJ, Bobrow M (1994). "Searching for the 1 in 2,400,000: a review of dystrophin gene point mutations". Hum. Mutat. 4 (1): 1–11. doi:10.1002/humu.1380040102. PMID 7951253. Tinsley JM, Blake DJ, Zuellig RA, Davies KE (1994). "Increasing complexity of the dystrophin-associated protein complex". Proc. Natl. Acad. Sci. U.S.A. 91 (18): 8307–13. doi:10.1073/pnas.91.18.8307. PMC 44595 . PMID 8078878. Blake DJ, Weir A, Newey SE, Davies KE (2002). "Function and genetics of dystrophin and dystrophin-related proteins in muscle". Physiol. Rev. 82 (2): 291–329. doi:10.1152/physrev.00028.2001 (inactive 2015-01-01). PMID 11917091. Röper K, Gregory SL, Brown NH (2003). "The 'spectraplakins': cytoskeletal giants with characteristics of both spectrin and plakin families". J. Cell. Sci. 115 (Pt 22): 4215–25. doi:10.1242/jcs.00157. PMID 12376554. Muntoni F, Torelli S, Ferlini A (2003). "Dystrophin and mutations: one gene, several proteins, multiple phenotypes". Lancet neurology. 2 (12): 731–40. doi:10.1016/S1474-4422(03)00585-4. PMID 14636778. Haenggi T, Fritschy JM (2006). "Role of dystrophin and utrophin for assembly and function of the dystrophin glycoprotein complex in non-muscle tissue". Cell. Mol. Life Sci. 63 (14): 1614–31. doi:10.1007/s00018-005-5461-0. PMID 16710609.